The time-lag method, using a gas permeation experiment, is currently the most popular method for determining the membrane properties: diﬀusivity coefcient and permeability coefcient, and from which the solubility coefcient can be calculated. In this investigation, the impact of systematic, random (noise), resolution and extrapolation errors associated with gas permeation experiments on the determination of the membrane properties using the time-lag method is investigated. A comprehensive error analysis for each type of errors and their combination is presented. Random and resolution errors have a greater impact on the determination of the time lag for low rates of downstream pressure accumulation which can be alleviated by increasing the capacity parameter. Increasing the feed pressure lowers the resolution errors, but has no eﬀect on random errors. Extrapolation errors associated with the time-lag method, which increase with time, can be reduced by increasing the number of evaluation points and the length of the evaluation window. Because of their strong correlation, it is difcult to decouple solubility and diﬀusivity coefcients accurately without using the time-lag. A judicious balance between data precision, the drop in the driving force and the duration of an experiment must be considered in the design of a constant-volume membrane system and in the selection of experimental operating conditions to minimize the impact of pressure variability. The necessity of a small capacity parameter for the accurate determination of membrane properties needs to be reconsidered in the presence of experimental noise. L.M. Robeson, The upper bound revisited, J. Memb. Sci. 320 (2008) 390–400. doi:10.1016/j.memsci.2008.04.030. L.M. Robeson, Correlation of separation factor versus permeability for polymeric membranes, J. Memb. Sci. 62 (1991) 165–185. doi:10.1016/0376-7388(91)80060-J. B.D. Freeman, Basis of Permeability/Selectivity Tradeoff Relations in Polymeric Gas Separation Membranes, Macromolecules. 32 (1999) 375–380. doi:10.1021/ma9814548. H.A. Daynes, S.W.J. Smith, The Process of diffusion through a rubber membrane, Proc. R. Soc. A Math. Phys. Eng. Sci. 97 (1920) 286–307. doi:10.1098/rspa.1983.0054. R.M. Barrer, E.K. Rideal, Permeation, diffusion and solution of gases in organic polymers, Trans. Faraday Soc. 35 (1939) 628–643. R.M. Felder, Estimation of gas transport coefficients from differential permeation, integral permeation, and sorption rate data, J. Memb. Sci. 3 (1978) 15–27. doi:10.1016/S0376-7388(00)80408-1. R.D. Siegel, R.W. Coughlin, Errors in diffusivity as deduced from permeation experiments using the time-lag technique, J. Appl. Polym. Sci. 14 (1970) 3145–3149. doi:10.1002/app.1970.070141218. L. Bao, J.R. Dorgan, D. Knauss, S. Hait, N.S. Oliveira, I.M. Maruccho, Gas permeation properties of poly(lactic acid) revisited, J. Memb. Sci. 285 (2006) 166–172. doi:10.1016/j.memsci.2006.08.021. F. Vasak, Z. Broz, A method for determination of gas diffusion and solubility coefficients in poly (vinyltrimethylsilane) using a personal computer, J. Memb. Sci. 82 (1993) 265–276. doi:10.1016/0376-7388(93)85191-X. K. Toi, T. Ito, T. Shirakawa, H. Ichimura, I. Ikemoto, Use of a microcomputer with a gas permeation apparatus, J. Appl. Polym. Sci. 29 (1984) 2413–2419. doi:10.1002/app.1984.070290715. S.S. Dhingra, E. Marand, Mixed gas transport study through polymeric membranes, J. Memb. Sci. 141 (1998) 45–63. doi:10.1016/S0376-7388(97)00285-8. J.P.G. Villaluenga, B. Seoane, Experimental estimation of gas-transport properties of linear low-density polyethylene membranes by an integral permeation method, J. Appl. Polym. Sci. 82 (2001) 3013–3021. doi:10.1002/app.2156. K. Mizoguchi, K. Terada, Y. Naito, T. Hirose, Y. Kamiya, Experimental estimation of gas-transport properties of linear low-density polyethylene membranes by an integral permeation method, Sen-I Gakkaishi. 46 (1990) 568–574. S. Lashkari, B. Kruczek, Effect of resistance to gas accumulation in multi-tank receivers on membrane characterization by the time lag method. Analytical approach for optimization of the receiver, J. Memb. Sci. 360 (2010) 442–453. doi:10.1016/j.memsci.2010.05.043. E. Favre, N. Morliere, and D. Roizard, “Experimental evidence and implications of an imperfect upstream pressure step for the time-lag technique,” Journal of Membrane Science, vol. 207, no. 1, pp. 59–72, 2002. A. Alsari, B. Kruczek, and T. Matsuura, “Effect of Pressure and Membrane Thickness on the Permeability of Gases in Dense Polyphenylene Oxide (PPO) Membranes: Thermodynamic Interpretation,” Separation Science and Technology, vol. 42, no. 10, pp. 2143–2155, 2007. Y. Maeda and D. Paul, “Selective gas transport in miscible PPO-PS blends,” Polymer, vol. 26, no. 13, pp. 2055–2063, 1985. R. Chapanian, F. Shemshaki, and B. Kruczek, “Flow rate measurement errors in vacuum tubes: Effect of gas resistance to accumulation,” The Canadian Journal of Chemical Engineering, vol. 86, no. 4, pp. 711–718, 2008. S. Lashkari, B. Kruczek, Reconciliation of membrane properties from the data influenced by resistance to accumulation of gasses in constant volume systems, Desalination. 287 (2012) 178–189. doi:10.1016/j.desal.2011.01.071. B. Kruczek, F. Shemshaki, S. Lashkari, R. Chapanian, H.L. Frisch, Effect of a resistance-free tank on the resistance to gas transport in high vacuum tube, J. Memb. Sci. 280 (2006) 29–36. doi:10.1016/j.memsci.2006.01.001. M. Al-Ismaily, J.G. Wijmans, B. Kruczek, A shortcut method for faster determination of permeability coefficient from time lag experiments, J. Memb. Sci. 423–424 (2012) 165–174. doi:10.1016/j.memsci.2012.08.009. P. Taveira, A. Mendes, C. Costa, On the determination of diffusivity and sorption coefficients using different time-lag models, J. Memb. Sci. 221 (2003) 123–133. doi:10.1016/S0376-7388(03)00252-7. R.C.L. Jenkins, P.M. Nelson, L. Spirer, Calculation of the transient diffusion of a gas through a solid membrane into a finite outflow volume, Trans. Faraday Soc. 66 (1969) 1391–1401. C.E. Rogers, Permeation of Gases and Vapours in Polymers, in: J. Comyn (Ed. ), Polym. Permeability, Springer Netherlands, Dordrecht, 1985: pp. 11–73. doi:10.1007/978-94-009-4858-7_2. J. Crank, The mathematics of diffusion, Oxford Univ. Press. (1975) 414. doi:10.1016/0306-4549(77)90072-X. J.C. Shah, Analysis of permeation data: evaluation of the lag time method, Int. J. Pharm. 90 (1993) 161–169. doi:10.1016/0378-5173(93)90152-6. D.R. Paul, A.T. Dibenedetto, Diffusion in amorphous polymers, J. Appl. Polym. Sci. 39 (1966) 1496–1512. doi:10.1002/app.1960.070041025. J.A. Barrie, H.G. Spencer, A. Quig, Transient diffusion through a membrane separating finite and semi-infinite volumes, J. Chem. Soc. Faraday Trans. 1 Phys. Chem. Condens. Phases. 71 (1975) 2459. doi:10.1039/f19757102459. X.Q. Nguyen, Z. Brož, F. Vašák, Q.T. Nguyen, Manometric techniques for determination of gas transport parameters in membranes. Application to the study of dense and asymmetric poly (vinyltrimethylsilane) membranes, J. Memb. Sci. 91 (1994) 65–76. doi:10.1016/0376-7388(94)00019-0. N. Al-Qasas, J. Thibault, B. Kruczek, The effect of the downstream pressure accumulation on the time-lag accuracy for membranes with non-linear isotherms, J. Memb. Sci. 511 (2016) 119–129. doi:10.1016/j.memsci.2016.03.047. H. Wu, N. Al-Qasas, B. Kruczek, J. Thibault, Simulation of Time-Lag Permeation Experiments Using Finite Differences, J. Fluid Flow, Heat Mass Transf. 2 (2015) 1–17. doi:10.11159/jffhmt.2015.003. S.W. Rutherford, D.D. Do, Review of time lag permeation technique as a method for characterisation of porous media and membranes, Adsorption. 3 (1997) 283–312. doi:10.1007/BF01653631. B. Carnahan, H. A. Luther, and J. O. Wilkes, Applied numerical methods. Malabar, FL: R.E. Krieger Pub. Co., 1990. J.H. Petropoulos, C. Myrat, Error analysis and optimum design of permeation time-lag experiments, J. Memb. Sci. 2 (1977) 3–22. doi:10.1016/S0376-7388(00)83229-9. D.M. Himmelblau, Process analysis by statistical methods, New York : Wiley, 1970. B. Kruczek, H.L. 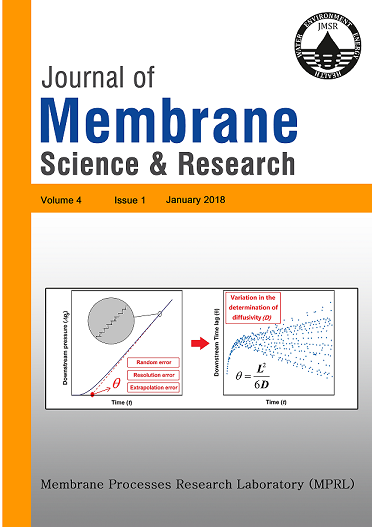 Frisch, R. Chapanian, Analytical solution for the effective time lag of a membrane in a permeate tube collector in which Knudsen flow regime exists, J. Memb. Sci. 256 (2005) 57–63. doi:10.1016/j.memsci.2005.02.006. S. Lashkari, B. Kruczek, H.L. Frisch, General solution for the time lag of a single-tank receiver in the Knudsen flow regime and its implications for the receiver’s configuration, J. Memb. Sci. 283 (2006) 88–101. doi:10.1016/j.memsci.2006.06.015.